Very soft, all season compatible, but not super fluffy. It has about a 2 inch fluff, but if you are something that is 4-5 inch fluff this isn't it. My wife and I still love this comforter though and it's perfect for our guest bedroom, especially at the price point. Honestly, can't beat it when you compare quality and pricing. We shopped around and couldn't find anything nearly as good as this at the price we paid. Highly recommend to anyone! 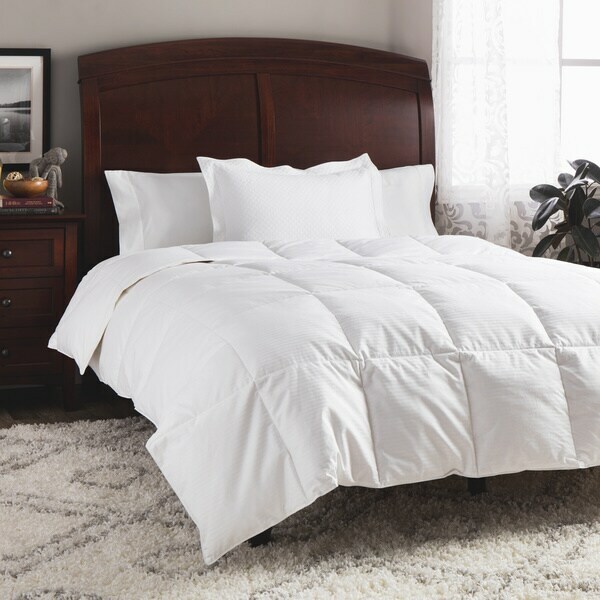 This medium weight white down comforter will keep you warm on those cold nights. An end to end box stitch keeps the comforter in place during the night. This piece is conveniently machine washable. A dobby stripe completes the look. The product arrived well packaged very compactly in a nice clear plastic zippered case. Upon removing it from the packaging and fluffing it for a short while, its volume plumped up relatively nicely. The baffles that hold the feathers in their places seem to be well sewn and robust. Yet the cotton fabric on the outside was soft and comfortable and cool to the touch. It has a very simple, yet classic look about it. Recommended! GREAT price for a down comforter! I have to say I was a little bummed at how thin it looked when I unpacked it. I fluffed it and it was still flat. After using it for a few nights it got super fluffy and I LOVE it. It does not get too hot and still keeps me so toasty. No lie, I have overslept twice this week because I could not get out of the coziness! Also it is well made. I had a down comforter previously and the ends of the feathers poked thru, not this one! I would be happy with it even at full price. I am completely happy with the weight and quality of this down comforter. It was a good buy! Very few down comforters are available at this price. The ratio of down feathers to goose feathers is excellent. Because it is a beautiful-looking comforter I do use a duvet to protect it. I like cold weather and always want the windows open in winter. At the level of a meat freezer! Being able to relax under my comforter and enjoy the cold air at the same time is really nice. I would definitely recommend this comforter to anyone who wants warmth at the lightest weight possible for a good price as I do. You will be happy with this as I am. This comforter is light weight like down but washable. The stripes and stitching add to the overall look. I am very satisfied with both the look and functionality of this product. Good quality duvet at a great price. I like that the squares are sewn all the way on each side, preventing the feathers and down from shifting too much. The pockets aren’t full, but full enough that I feel warm in my house that I keep at 64 degrees F at night. Love it. It feels amazing. So happy it is machine washable as well. It gets fluffier after a few days so be patient. Would recommend this product 100%!! love love love this comforter. it was easy to tell ( not by price but by how it was made and all down, not a mixture of down and feathers. living on the east coast, we often keep the fire place going all night and sometimes need two down comforters. during the summer, since down "breaths" it is nice to have the weight but not too warm. I bought this as a gift for someone, so I am not using it myself, but the reviews back from her have been good. I've owned several down comforters, so I bought it because of its 75 down/25 feather construction, good quality thread count, and box-style weave, which stops the fill from moving around too much. It's a good entry-level down comforter. great for the price-very light-weight and yet warm enough for cold nights. Too bad they started leaking feathers after a few weeks. It is a lightweight duvet so does not feel that there's a ton of material on top of you as you sleep, but it also keeps you super warm. This comforter has a nice weightiness to it but it's not too hot. I like to sleep with it cool and I easily overheat and I haven't had any issues with this comforter. For coastal living, or anywhere with hot, humid summers, this is the perfect weight comforter! It's warm enough too in the winter, but light weight enough to use year round. I've purchased one for every single bedroom. So warm and perfect weight to make you not want to get out of bed! One of the best purchases that I have made. It is extremely comfortable and will defiantly keep you warm at night. Great value. The cover has a nice crispness with out sacrificing softness. It does take a few days to get to the full fluffiness. Exactly as described and pictured. Very soft and warm, nice colors, and the pockets keep the feathers from settling in one area of the blanket. Well worth the cost. "If it is a duvet insert, does it have anything to attach to duvet? were any of the white down feathers bleached white or treated to be white?" There are no corner ties on this item. Typically these comforters go into the duvet and there is not that much shifting in the duvet cover. As far as the down/feather filling, we do clean it and treat it with our Oxi Clean technology to make sure fibers are clean and this also reduces the allergens typically found in down and feather products. This is perfect for a duvet cover. I've never seen any sort of attachments for a duvet and have owned many for nearly 30 years. You will need to shake the comforter occasionally when making the bed to distribute. "Is this a loud comforter? Can you hear it make sounds when you move in bed? " Very soft and not too loud. "Would this do well inside a duvet cover? Are there buttons or snaps to secure duvet cover? " This would work well inside a duvet cover but there are no buttons or snaps to secure it. High reviews and a good price versus other options.